Follow my easy tutorial to create your own fall-inspired sunflower and burlap candle table centerpiece! It’s perfect for fall and Thanksgiving! It’s finally October! My favorite time of the year! I just want to stop the clock right now and let time stand still for a little bit. I love this time of year, all of my favorite holidays are coming up and our wedding is in February. We have so much to look forward too! I get a little down the day after a major holiday because all of the fun and excitement is over so I really like to enjoy each day leading up to the event. I love the anticipation! I love the whole season of fall and everything it brings with it. There are so many fun activities to do and some of our favorite events are coming up too! If you’re in the Tampa Bay Area, check out my list of our favorite fall activities! I saw a meme the other day on Facebook that really made me think. It said “Autumn shows us how beautiful it is to let things go,” and the picture was a leaf falling from a tree. How true that is! Travis and I will be starting a new life together soon and letting go of our individual single lives in order to create one family unit. Letting something go just opens you up to more wonderful and beautiful things! 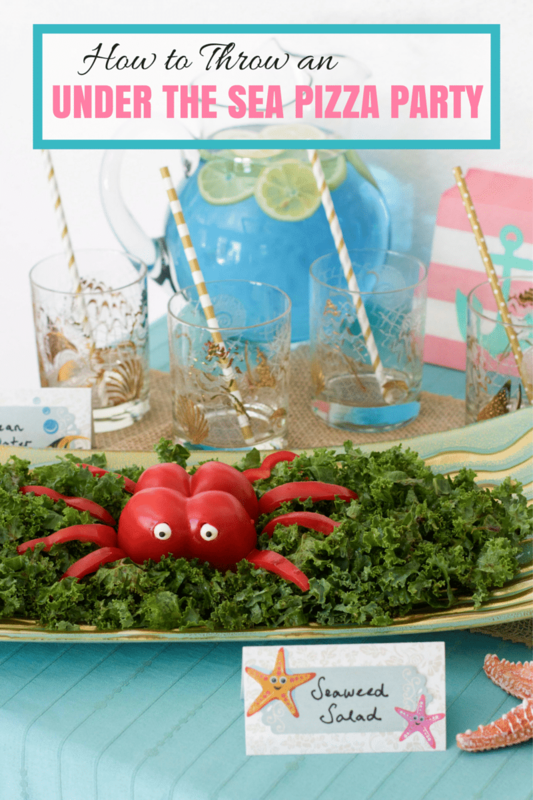 Easy instructions to setup and throw your own under the sea pizza party! Sea creature recipes and an aquarium in a jar craft included! Summer is less than one week away! It’s felt like summer here in Florida since April. It’s hot and humid every day and we usually get quick afternoon thunderstorms and the occasional magical sun shower. Have you ever seen a sun shower before? It’s strange and beautiful at the same time. If rain comes from clouds, how can it be perfectly bright and sunny but it’s drizzling too? I’m sure there’s a logical explanation but I don’t want to know the answer because it’ll take away some of the magic of sun showers. Have you seen that meme going around on Facebook of two pictures of Florida weather? The left side shows a dark and stormy thunderstorm passing through the beach, and the right side is a perfectly bright and sunny beach day that is captioned, “5 minutes later.” It’s so true. One minute it’s raining and then it’s bright and sunny and time to go back to the beach! Long summer days at the beach are one of my favorite childhood memories. My parents always had activities planned for us but beach days were the best! Follow my easy DIY tutorial to create your own ultimate snack stadium for the big game! What could be a better game day buffet centerpiece than a snack stadium?! It looks so much cooler than just laying your snacks out on the table in bowls or platters– boring! With the big game day quickly approaching, I had to start working on my ultimate snack stadium asap. I borrowed this awesome football field platter from my mom. Isn’t it the perfect base for the snack stadium? It looks like a real football field!